The elder bush is, at first sight, a rather unprepossessing and noxious plant. The wood is no good for burning, and it is a liability in a hedgerow in the eyes of the farmer trying to keep the hedge stock-proof. However, the berries in autumn are tasty and can be turned into terrific produce. For my money, the real power of the elder is in the flower, as it can impart the most incredible flavour to wines, drinks and jams. A very basic drink is Elderflower Cordial. 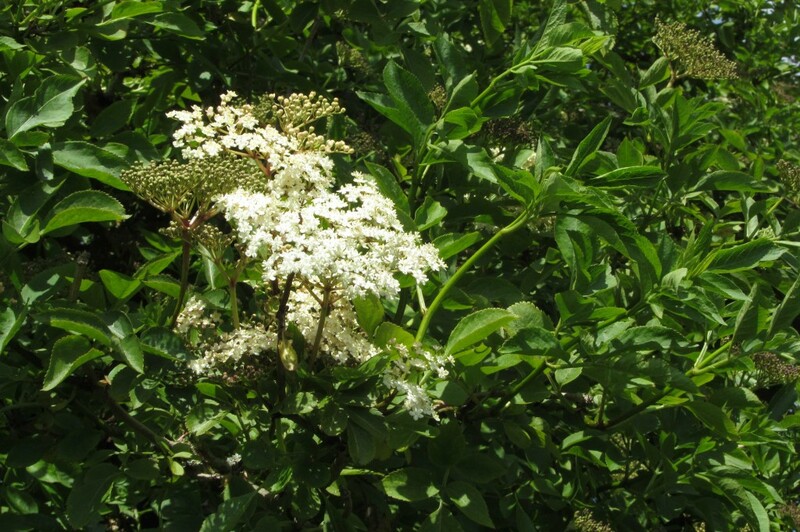 Collect a shopping bag half-full of elderflower heads, trying to avoid the leaves. Snip the florets off the thicker stalks, and place in a plastic bucket. Boil up a syrup of sugar and water – the proportions aren’t vital – about 500g sugar in 3l water would be fine. You could vary the proportions depending on how sweet you like it, but that will take a few goes to work out. Pour the boiled syrup over the flowers, and mash them up a good bit. Leave to stand for 24 hours with a cloth over the top, and then strain the liquid, bring to boiling point and then leave to cool before bottling. Elderflower Fizz or Champagne is very refreshing and delicious – I don’t know how alcoholic it can be, maybe not at all, but the one made with yeast probably has some alcohol in it. Elderflower Fizz uses 1 gallon (4.5 litres) of water, 1.8 kg (4 lbs) sugar, 6 chopped lemons, 6 large elder heads, 4 tablespoons white wine vinegar. Boil up at least half of the water, put the sugar into a sturdy and clean plastic bucket, pour on the water and stir to dissolve the sugar. Add the rest of the ingredients, stir well, cover with a teatowel and leave for 24 hours. Strain the liquid through a cloth and bottle – I use old screw-top wine bottles, well washed out and sterilised in a low oven. Label and date. Best left for a couple of weeks – it will keep for a few months in a dark, cool place, but will eventually go flat. For safety’s sake, put the bottles in a cardboard box in case they burst. Elderflower Wine is made by fermenting a similar mixture with yeast, and is a really nice drink, although pretty alcoholic. 10 flower heads of elder, 1.5 kg sugar, 250 g raisins or 140 ml white grape concentrate, 3 lemons (rind, juice but not the pips or pith), 1 teaspoon grape tannin, yeast, nutrient and 4.5 l water. Snip the florets into a plastic fermenting bin, with the sugar, raisins/concentrate and lemon rind and juice. Add the boiled water, and leave to cool before adding yeast, nutrient and tannin (teaspoon of each). Allow to ferment for a few days before straining into a fermenting jar and proceeding as usual. Elderflower Quencher is similar to Fizz, but uses less sugar. It uses 1 gallon (4.5 litres) of water, 0.7 kg (1.5 lbs) sugar, juice and grated rind (no pith) of 2 lemons, 10 large elder heads and 2 tablespoons white wine vinegar. Do the same stuff as for the elderflower fizz, and don’t forget to label and date, as this is useful for remembering what’s what for next year. Elderflower Champagne can be made using yeast. Again, there are oodles of ways of doing this, but this method seems to produce a good result. Best to use a fermenting jar as for wine. Take 10 elderflower heads, 600g (1.5 lbs) sugar, 1.5 tablespoons of cider vinegar (or white wine vinegar), 4.5 litres (1 gallon) water, the juice and grated rind (no pith) of 2 lemons, and a teaspoon (or small sachet) of dried yeast. Do much the same for the other fizz and quencher recipes, but after it has cooled to a tepid temperature, add the yeast and tightly cover with a cloth. Leave in a warm place for about 4 days to start fermenting, and keep an eye on it to see how it progresses. Strain after 4 days into a demi-john, stoppered with cotton wool. If vigorous fermenting has stopped, and there is a light sediment, it can be bottled. Use plastic drinks bottles, as this continues to ferment slowly and the tops need to be released every few days or else the bottles may burst. Try after a few weeks if you can resist the temptation.